The past couple of months, I’ve been experimenting with the Instant Pot. I have not come across a single kitchen tool that allows me to so effortlessly cook healthy meals in a minimal amount of time. Plus I don’t have to stand there and tend it–it takes care of itself. Think of it like a Crockpot or slow cooker, only in a very short amount of time. I call my Instant Pot the Time Machine. It is like it travels forward in time and beep, beep, beep…dinner is ready! I’ve enjoyed making macaroni and cheese in just a few minutes, making refried beans that provide great burrito fillings all week long and lots of cheese grits. Let’s talk a minute about the Instant Pot. I have the six-quart duo, which means it has high and low temperature settings. I haven’t come across many recipes that use the low temperature setting except yogurt. If you don’t plan to make yogurt, you’ll do just fine with the basic six-quart Instant Pot which will save you a few dollars. I got mine on Prime Day from Amazon and am so hopeful it will soon be offered at that incredible price again so more of you can get in on this goodness. And a few words on ingredients: It’s not often I include instructions for adding meat to a recipe because I am vegetarian. But I have to tell you, many meat eaters enjoy my recipes with simple additions of meat. This recipe works with ground meat, Beyond Meat which is a meat substitute or crumbled tempeh, which is a cultured soy alternative to meat. Something to work for everyone here. As for pasta, I’ve used Banza. I just don’t find myself enjoying other gluten-free pasta as much as Banza. The ingredients are super simple, it’s high in protein and lower in carbs than the alternatives and the texture is nice. It also reheats well when we have leftovers, which is pretty important in our small household where leftovers are common. Sauce! I used the organic marinara from ALDI for the first couple of batches of this, then switched to a pasta sauce from Trader Joe’s and finally tried a canned pasta sauce made with a friend’s garden harvest. Every sauce I’ve tried has worked just fine. Alright! Ready for the recipe? I am! Click below for the super easy, quick and simple recipe to make Instant Pot Pasta with Meat Sauce (gluten-free, dairy-free, vegan options)! I keep hearing awesome things about Instant Pots! I need to look into one! I am sure enjoying mine, Jenni! I need to get an instant pot! I have a pressure cooker so I think they’re pretty much the same, but everyone is talking about these! I do think they are much like a pressure cooker, only with more bells and whistles. I had used a traditional pressure cooker for canning before and also for cooking dried beans. The Instant Pot also works like a slow cooker, has a saute feature and a yogurt setting, as well as lots of other things I haven’t even figured out yet. Some models are even Bluetooth-enabled! These instant pots are really getting around! I need to get one to see what all the fuss is about. Your pasta dish looks delicious! 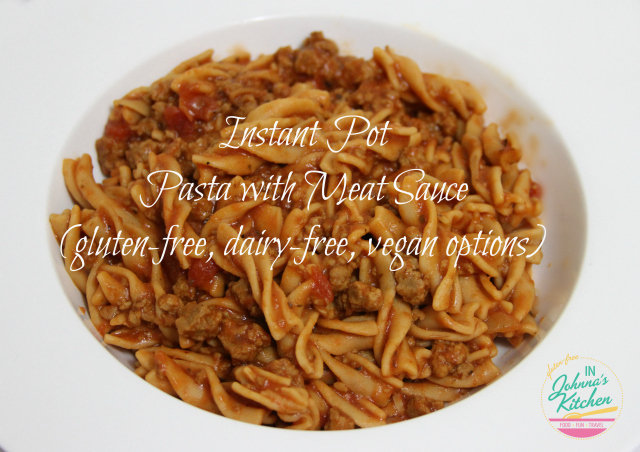 Never heard of the instant-pot before, looks like it does an amazing job, looks delicious! Such a handy kitchen appliance! Certainly not the stovetop pressure cooker that caused much anxiety in the old days! I recently bought an off brand pressure cooker after seeing all the great things you’ve been making with your Instant Pot. Today I made my first meal in my cooker using this recipe. It was awesome! I used ground beef and substituted the noodles for non GF noodles. The instructions worked exactly the same as the Instant Pot. Thanks for this! Yay! I’m so excited it worked well and really glad to hear a review from a brand other than Instant Pot. 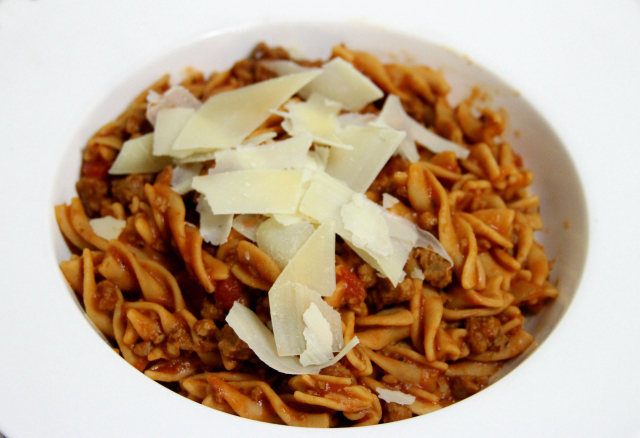 Have you made this using brown rice pasta? How did it come out? I can’t have chickpeas and I think the brand you recommend is made from them. Thanks! Hi Carla! This recipe has been used by so many people now using a variety of pastas, from “regular” (with gluten) pasta to quinoa/rice pastas. I have personally used the brown rice spaghetti from Trader Joe’s with this recipe and it turned out great! What size instant pot are you using? I am using a six-quart Instant Pot. Quick question. The gluten free pastas can get soft really fast. I haven’t tried my GF Pasta in the instant pot because I only like gf pasta al dente. Does doing it in the IP make it a softer pasta or no?? I am having better luck with gluten-free pasta in the pressure cooker than other cooking methods. That said, I am a big fan of Banza chickpea pasta because it tends to maintain a good texture, even when being re-heated. I cooked some gluten free pasta in my instant pot and it came out mushy, same with white rice. I don’t see any recipes for either of these things in the recipe book (I have a Mueller) I am in the experimental stages with my pot and recommend that if you’re going to cook white rice or gluten free pasta lower the cooking time/temperature since these products are delicate and can’t handle the pressure like higher gluten products. This is what I’m doing and hopefully next time things will come out better. But, I have to say, after I cooked a Field Blend of brown rices in my pot it came out “perfect!” Was I pleased. So you learn what works and what doesn’t. This recipe was made with gluten-free pasta, Banza to be specific. It’s also been tested by my team of cookbook recipe testers (so excited about this upcoming pressure cooker cookbook!) with multiple brands of gluten-free pasta, including Barilla and the Trader Joe’s private labeled offerings. No one has had trouble with the times included in this recipe turning the pasta to mush. I don’t recommend adjusting the time or pressure level in this recipe, as it works well as shared here. Is there a way to make meatballs with this instead of just meat sauce? Can it all be cooked as a one pot meal? I’m not sure on the meatball question. I only make it with ground “meat” (a meat substitute). Do you need to alter the time and liquid if you’re only cooking the pasta? Do you mean only cooking pasta in tomato sauce? If so, no, you don’t need to alter the time. I don’t recommend cooking pasta in water only in the IP though. It’s a foamy mess and takes a long time to safely release the pressure.